An NYPD officer has been placed on modified assignment following claims by former tennis professional James Blake that he was thrown to the ground and then handcuffed while mistakenly being arrested Wednesday at a Manhattan hotel, police said. Police said undercover investigators were probing a theft ring that uses fraudulent credit cards to make cellphone purchases use a deliveryman to deliver the packages, and that deliveryman has been helping law enforcement by identifying suspects in the ring. 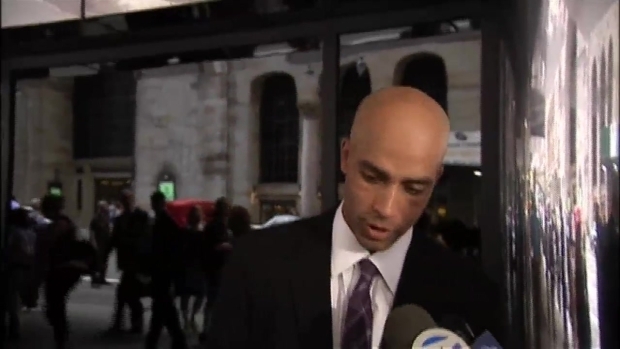 Former tennis star James Blake tells reporters that he hopes there's video of his encounter with cops earlier Wednesday, when he was swarmed in a case of mistaken identity. On Wednesday, he pointed out Blake as a suspect in the ring as Blake was standing outside the Grand Hyatt Hotel on East 42nd Street, police said. Blake, 35, was waiting for a car to take him to Flushing Meadows when the undercover officers approached him, slamming him to the ground and cuffing him, The Daily News reports. Blake told reporters outside the hotel Wednesday evening that the officers said nothing to him as they swarmed him. Internal affairs investigators are reviewing surveillance video of the incident. Blake, who was born in Yonkers and grew up in Fairfield, Connecticut, told NBC 4 New York he planned to speak to the media Thursday, after he has a chance to hear what police have to say on the matter. "It shouldn't have happened. It's something we'll deal with with the police and we'll find out what they have to say internally," he said. "Hopefully there's video of it and people can see what happened." Blake told The Daily News he had just answered a few questions from a magazine writer and was texting when he looked up and saw someone in shorts and a T-shirt charging at him. He assumed the man was perhaps an old acquaintance who wanted to greet him, so he smiled at the man. But the man allegedly threw Blake down on the sidewalk and yelled at him to roll over, telling him, "Don't say a word," according to the Daily News. Several other officers swarmed him and told him he was identified as a suspect in an identity theft probe. A retired NYPD officer who was working as a security guard at the hotel recognized Blake and told the officers, "That is James Blake, the tennis player," according to the Daily News. Blake urged the officers to look at his license and his U.S. Open credentials in his pockets. That's when the officers realized their mistake. They apologized, according to the Daily News, but the first officer who tackled him never said a word. In a statement to NBC 4 New York, NYPD spokesman Peter Donald said a cooperating witness had misidentified Blake. "Once Blake was properly identified and found to have no connection to the investigation, he was released from police custody immediately. In regards to the alleged improper use of force, the Police Commissioner directed the internal affairs bureau to investigate," the statement said. Blake, who is biracial, told the Daily News: "In my mind, there's probably a race factor involved, but no matter what there's no reason for anybody to do that to anybody." He says he wants an apology from police. Speaking on the NY1 cable television news station, Police Commissioner Bill Bratton said Blake "has a right to be upset." Bratton vowed to aggressively address Blake's allegations. "It's very disturbing," Bratton said. "The nature of what he described is not what we do; it's not what we're supposed to do." Bratton said internal affairs detectives were sent to the hotel and have already identified "a number of witnesses." He says investigators are also looking to obtain surveillance video from the hotel that may have captured the arrest. At the peak of his tennis career, Blake was ranked No. 4 in the world. Knee problems and other injuries affected his playing and he retired from tennis after a three-set loss at the 2013 US Open. The Harvard-educated player was known for his charity work throughout his career.